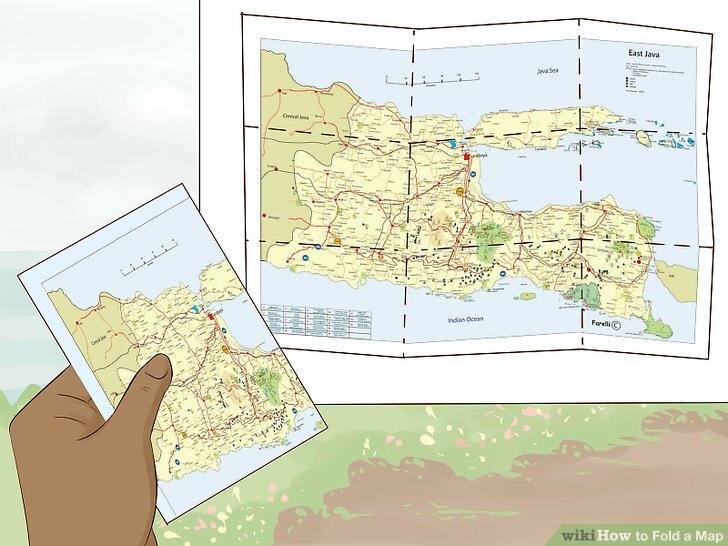 Maps are essential navigation tools, but they can be bulky and hard to carry. 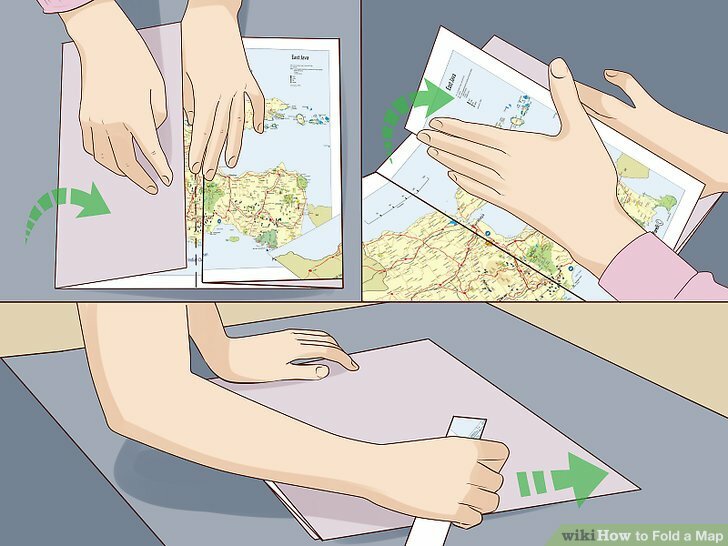 Knowing how to properly fold a map will save you time and energy by allowing you to access it more easily, as well as conveniently carry it long distances in small spaces, such as your pocket or backpack. Lay your map face-up on a flat surface. Clear a surface that is a comfortable height so you can reach all four corners of the map without straining. 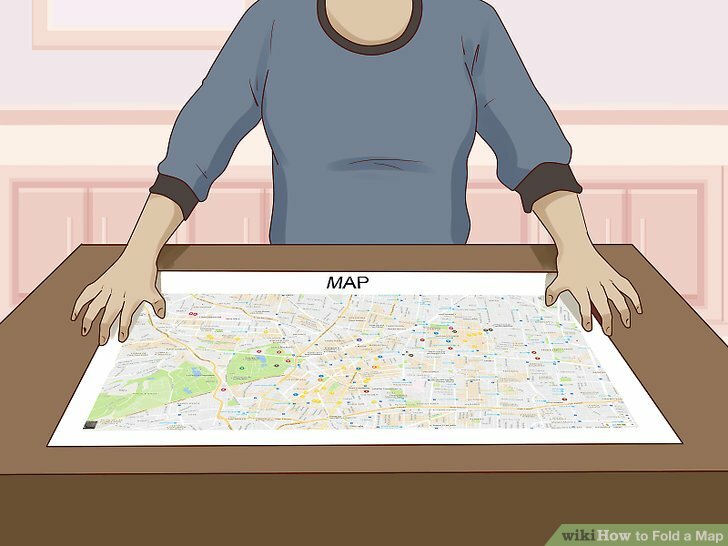 Use a surface that is large enough that the entire map fits on it when laid out flat. If the map is hanging off the edges of the surface, it will be more difficult to fold evenly. 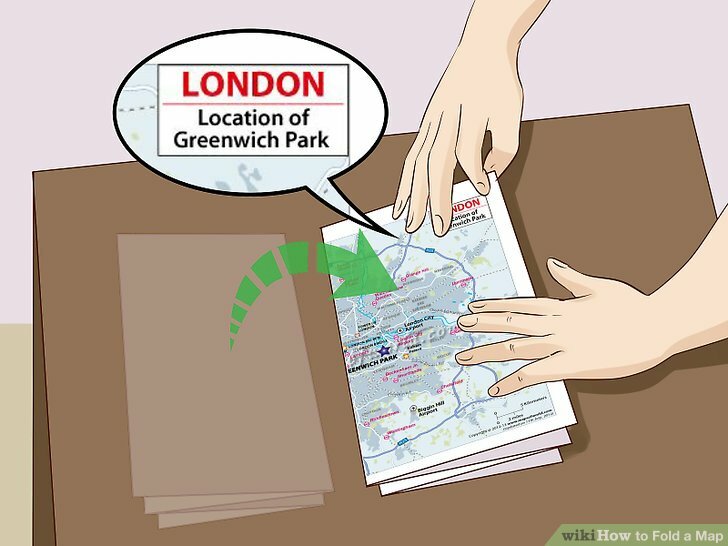 Fold your map in half crosswise. To do this, position the West side of the map on your left and the East side on your right. Take the West side of the map and fold it over directly on top of the East side. 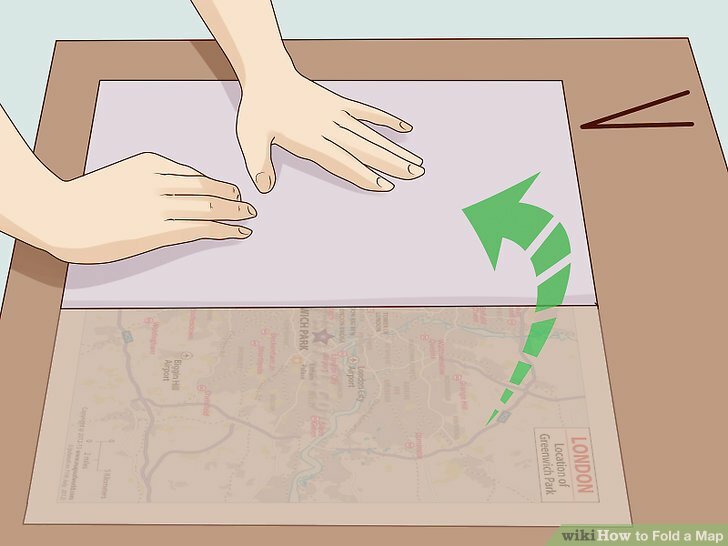 Carefully line up the edges of the map, then press down to create a crease. Use a ruler or a roller for a sharper crease. Unfold the map and lay it out flat. 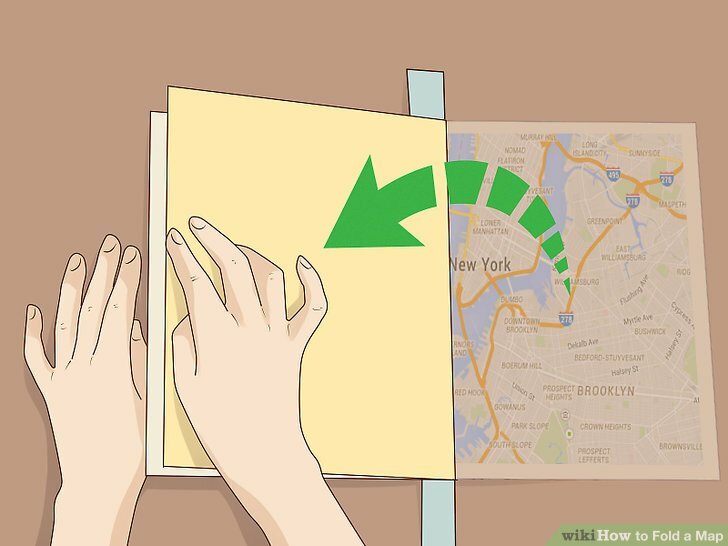 If the crease is not sharp enough or is not centered, re-fold the map until you have two equal sections that are clearly divided by a sharp crease. You should now have a single, sharp crease down the middle of the map. Fold one of the outer edges inward to touch the center crease. Folding in the same direction (crosswise), line up the edge of the map with the crease you just made. Once the edges are lined up properly, press down on the fold to make a new crease. Grab the outer edge of the section you just folded. Fold this section back toward you and line up the edges. Once the edges are lined up properly, fold it down and make a sharp crease. This fold should be half the width of the last fold. Flip the map face-down. Do not unfold the folds you just made. Bring the folded outer edge back to the middle crease. Line the edges up carefully, and use your roller, ruler, or fingers to fold down the edge. 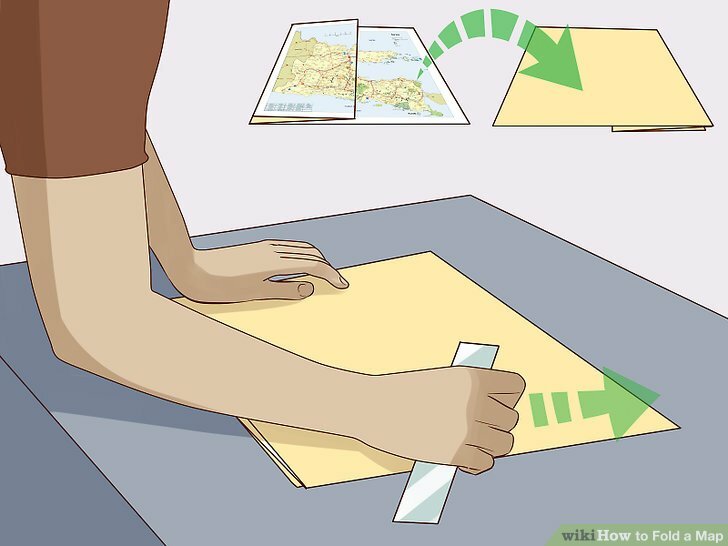 It may help to position the map vertically, so that you are directly in front of the part of the map you’ve been folding. Flip the map back to the front. Position the map so that the unfolded side is facing you. Half of the map should now have four vertical fan folds, and the other half should have none. Repeat steps 4-6 for the second half of the map. When working on the second half, you can either unfold the section you just folded or leave the folds as they are. When you are finished, the map will have 8 equal, vertical panels. 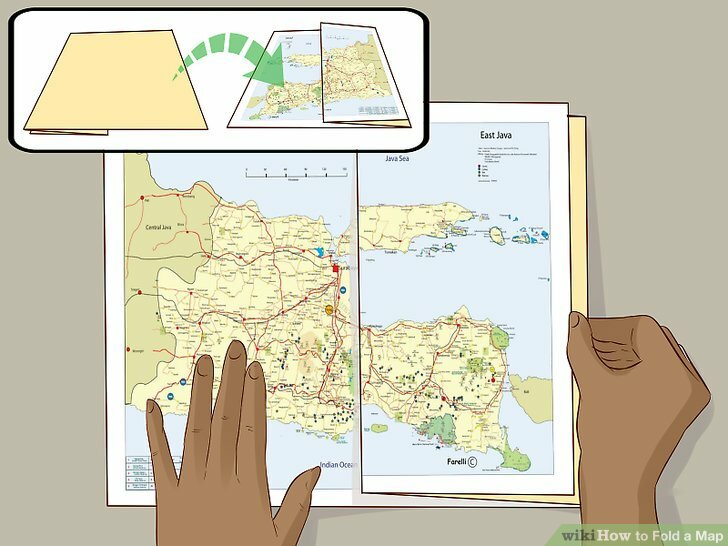 Fold the map in thirds, crosswise, to save space. 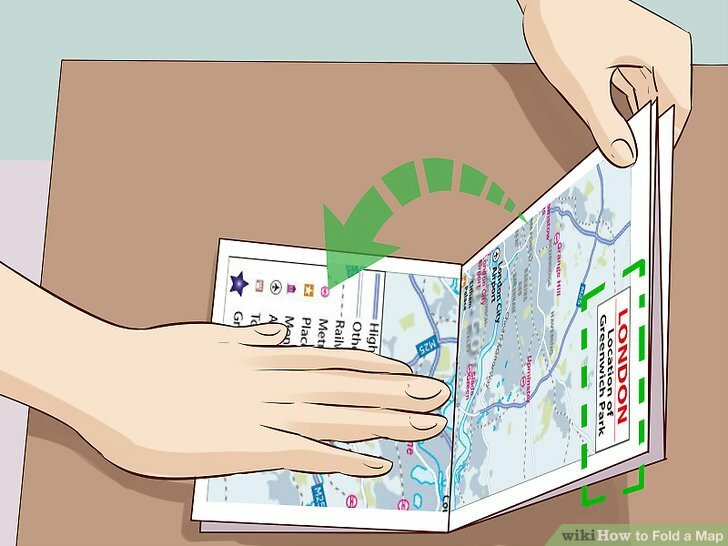 If your map is still taking up too much space after folding it accordion-style, you can make it smaller by folding it into thirds. 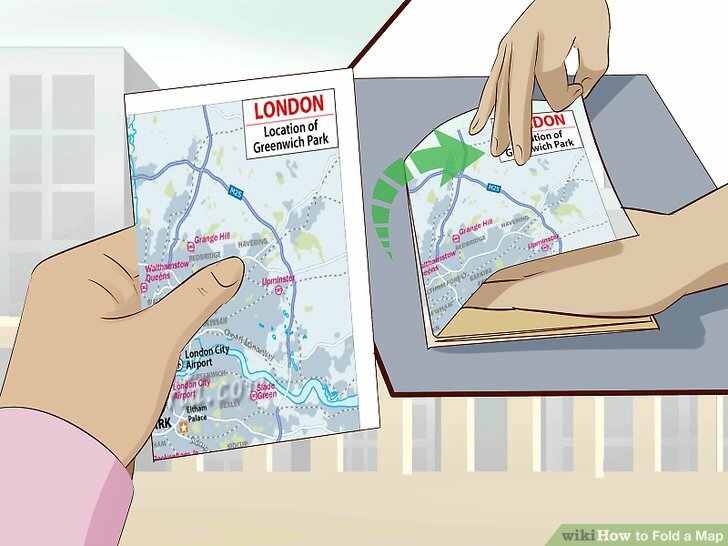 If your map has a front panel, use that as a guide for where to make your first fold. The second fold should be the same size as the first. Make sure the front panel ends up on top. 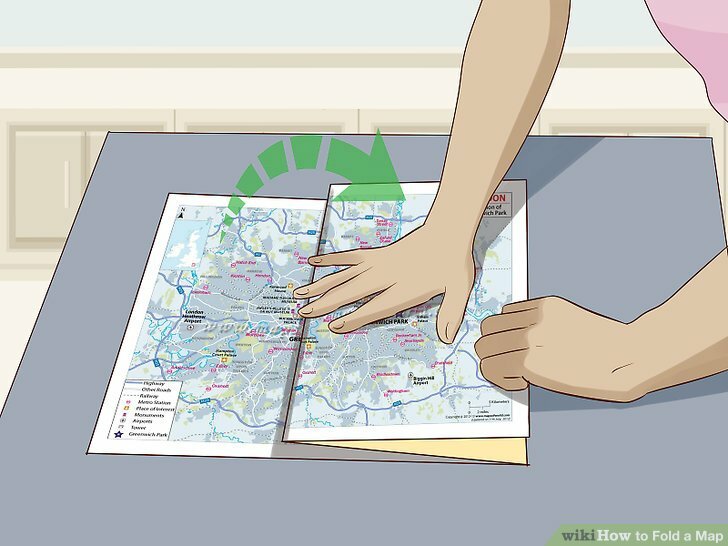 If your map does not have an obvious front panel, fold each end at approximately from the edge. 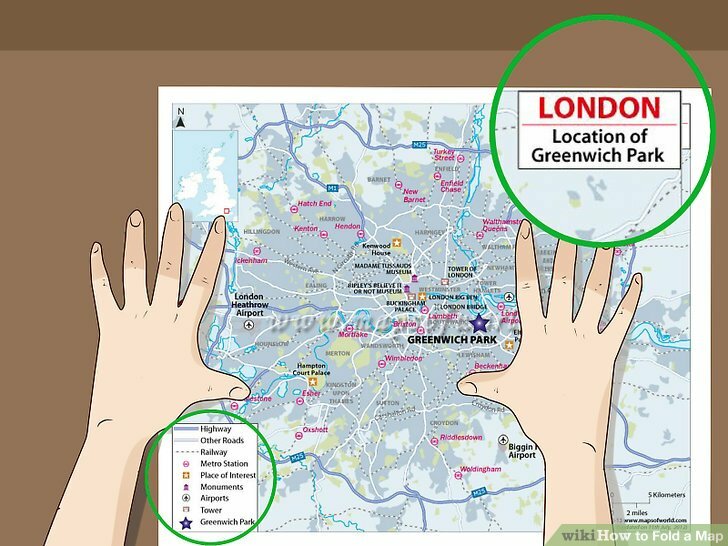 Place your map face-up on a large, flat surface. Make sure the surface is at a comfortable height so you can reach all four corners of the map without straining. Use a surface that is large enough to support the entire map. If the edges are hanging off the surface, it will be more difficult to fold it neatly. Note the different places where the name is located on the map. Position the map in front of you so the map's name is located in both the top right and bottom left corners. You'll be using these to guide your folds. 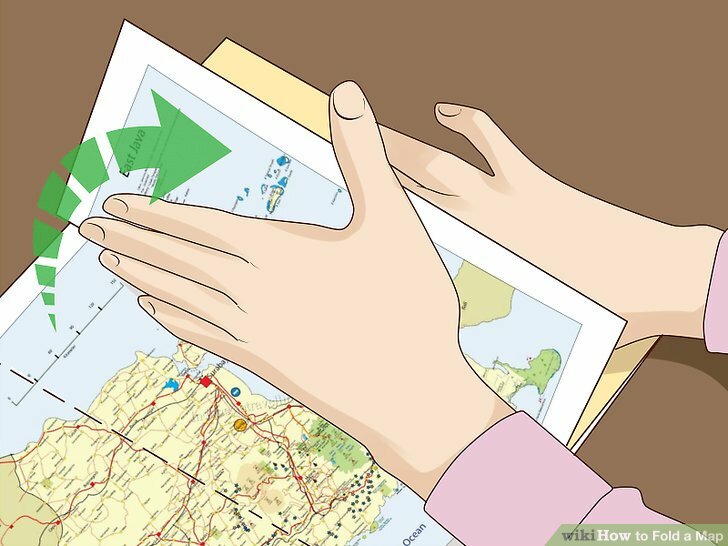 Using the name of the map to guide your folds will ensure that the name of the map is facing up when it’s closed. This way, if you have multiple maps, you will be able to locate the map you're looking for without having to open them all. Fold the top right corner of the map face-down on the top left corner. Carefully line up the edges and press down on the fold to create a sharp crease. You should now have a single crosswise fold in the center of the map. The front of the map should not be visible after this fold. Use a ruler or roller to create a sharper crease. Bring the same edge halfway back toward the outside of the map. Line the edges up carefully, then fold the crease down. The front of the map should now be facing upward. Flip the map upside down and position the unfolded edge in front of you. 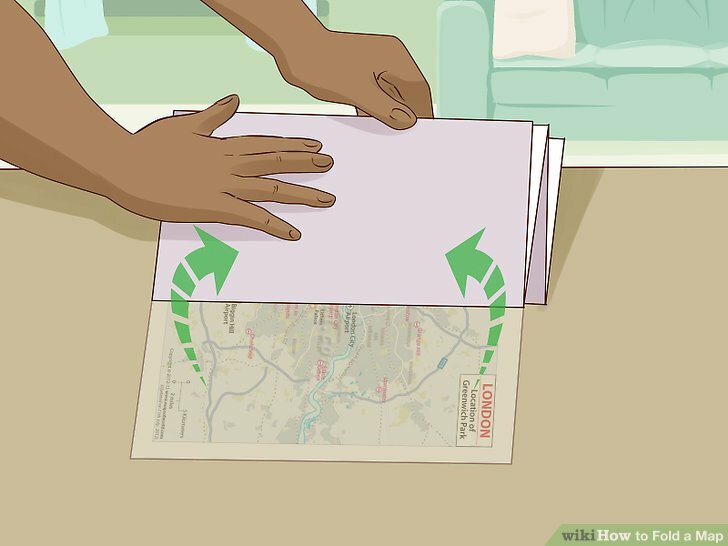 Do not unfold the part of the map you just folded. Fold this edge of the map halfway back, identical to the fold you just made. Your map should now be folded into four equal quarters. Re-locate the names on the top and bottom of the folded map. You may need to flip the map over to find the names. Keep your map folded and position your map so the names are facing up. Fold the map in half so that the top name touches the bottom name. Don't open the folds you've already made. Instead, fold it down the middle of all four quadrants. Line the edges up carefully, then press down to create a sharp crease. After this fold, the map names should no longer be visible. Peel the section you just folded halfway back toward the outside edge. Line the edges up carefully, then press down on the crease. Flip the map over and repeat the same fold on the other side of the map. Both names should now be facing up. You can now conveniently see the name of the map while it’s folded, no matter which way you look at it. This is especially helpful when you have multiple maps, because you don't have to open them all to find the specific map you're looking for. If your map is still too big, try cutting the edges off. Just make sure you don’t cut off important reference material you may need, such as the scale or key. Carry your map in a waterproof bag, such as a Ziploc baggy, to protect it from weather damage. Never use a map while driving! Always have a passenger navigate for you or pull the car to a stop before using a map.